Follow Through More Often With This Smart Phone Tweak! Most of us have smart phones these days, and many of us depend on a number of different apps to keep us organized. 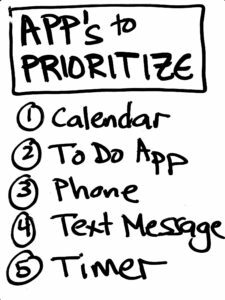 With a certain subset of my teen clients, however, I’ve noticed that they don’t have their time management apps organized in such a way that they are easily found. Check out the video below to discover a simply tweak that every student should consider to make their most important time management apps more accessible. I’ll also introduce you to the most important time management apps to prioritize when you reorganize your home page.